One of the reasons why I love Caitlyn Doughty is the way she approaches death. Literally and figuratively. It was serendipitous she happened to post a NYT article today on decomposition. Honestly, it is what I think about when I have been working on my new project, “As above, so below.” With the majority of my pieces or products I’m marrying my practice and interests, these bottles are the result of “spiritual decomposition” and reflection on the relationship to nature to myself as a mortal being. There has been a flurry of interest in ‘memento mori‘ recently and the science of death. This is a good thing. I won’t justify and lament on how my work is different than other makers of terrarium or memento mori art work. We all share certain visions and express them in a way that makes sense to us. Frederik Ruysch as other classic anatomists has reinvigorated the study of anatomy, botany, and vanitas for new makers of oddities and the like. I will say the difference between much of what I do and many other makers is I don’t want to present the work as a static, preserved, and sterile work. It is form and function with a dose of aesthetics, but the materials I use in my work will probably decompose or at least shift in time. I will not use any adhesive or “cleaning” technique when constructing my terrarium or talisman bottles. The downside to this, they don’t travel well, as far as something to be shipped. I would rather not purchase pre-cleaned animal bones or any other kind of post-mortem material, partially due to ethics and my own approach to this project. These materials are part of an micro-ecosystem within the bottle and holistically are one in the same. I am gifted with many of the materials from my loved ones from their homes and areas, as I also find the materials myself in nature. The one aspect that is more difficult are the precious stones and rocks I acquire; I generally go through a seller I trust for those. 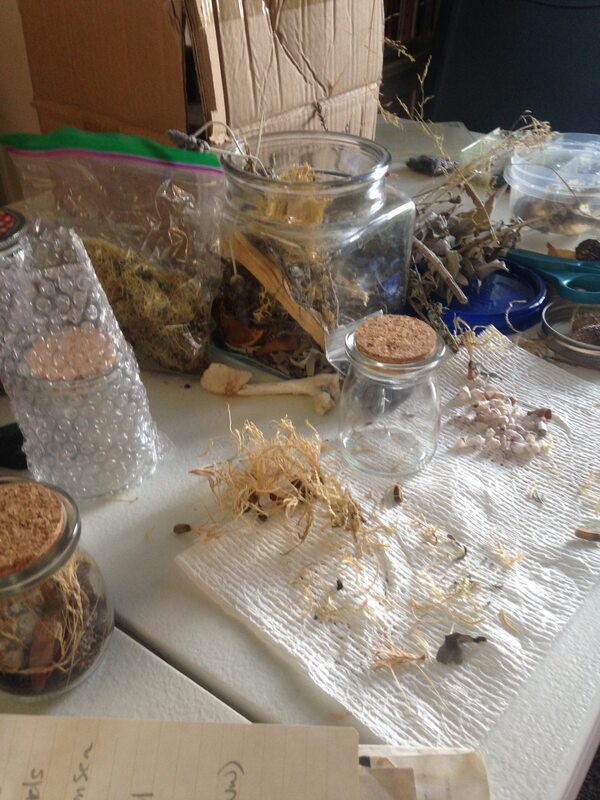 Another facet to the project is taking flora and geological materials from different bioregions and composing the “weed altars” to create more magical spaces and environments that wouldn’t exist elsewhere in life. There are certain organisms that do not grow cohesively with other in the natural world. One taken out of their natural environments, these plants derived of their hosts are essentially deadened. How they react after that is up to the environment themselves. One of the reasons why I chose to use ‘dried’ plants and/or sun-bleached bones in the first place. These organisms have already gone through a state of decomposition. As they are derived of oxygen, however, that process is slowed, however, even in the state of ‘death’ microorganisms survive, as they pass through my process of handling. As with a previous blog, I also work with cemetery dirt and continue to do so with this project, keeping in mind my ethics and the ethics of the dead and the ones that remain. “As above, so below” is a mantra that brings about such a change the magician uses the conception of “dynamic interconnectedness to describe the physical world as the sort of thing that imagination and desire can effect.” Imagine places co-existing within world above and below, in death and life. I’m trying to depict with intent, that death and life are integrated in nature, rely on each other, and are necessary to understand place. These works are ritual for me and possess much of my intent to exemplify beauty and grief.